It’s amazing in what I can notice when my name is out there in lights and cruising down Basin St. Okay, I don’t really own this diner or even cook here, but I can dream. Apparently this place reopened not too long ago, and locals have praised it’s return. As a fellow Ed, I have to applaud more than just that. This place was probably once a real drive-in at some point in time, and there’s an atmosphere in here that’s reminiscent of an era long gone. It has a very simplistic casual vibe that I could just feel by looking around. I’m at home, even though the eyes say otherwise. Even though my iced tea ($1.50) was almost forgotten, the waitress apologized when she walked by and it was served right away. While Yvonne enjoyed her breakfast here, finding the eggs very delicious, I opted for a lunch. Normally I’d say burger and fries, but wait! There’s another option. I heard the word chips and I couldn’t stop eating them off the plate until they’re all gone. Not many places crisp fries the way I like them, and that’s been a quest of mine for some time. Not all fast food chains, restaurants and diners twice fry them, and not all of them do it right. Some use different oils or just let too much time pass by before dipping them in again to seal in the flavour. Some fries are even battered, and I think these fries I ate were just lightly floured to produce that inviting crunch. It was so crispy on the outside and fluffy on the inside, I’d swear I’ve found french fry heaven. Normally the term, chips, is used in the UK to describe fries, but when asked how i liked my starch, I was impressed to hear the three options. There’s kettle too, and that was how they were made back at the Cougar Bar & Grill. 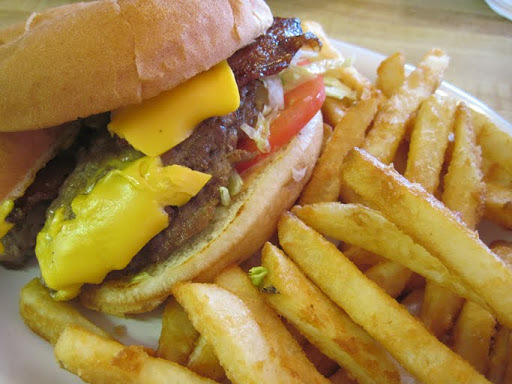 While I munched away on all the chips, it made my bacon burger ($7.53 after taxes) feel very lonely. While the burger had a great flavour, the extra fixings helped make me feel like part of Americana. I asked for cheddar, lettuce, tomato and onions. Although I could’ve gotten the same thing for less at a fast food chain, the extra attention in the quality of the ingredients and preparation made for a huge difference. There’s no comparing against Canadian bacon, but I welcomed the change. In Ephrata, this is one place where I’ll be screaming Hallelujah! 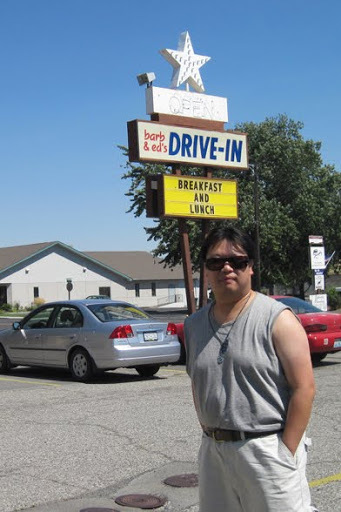 This entry was posted in Food, Reviews and tagged Breakfast, Burgers, Diners, French Fries, Road Trip. Bookmark the permalink.